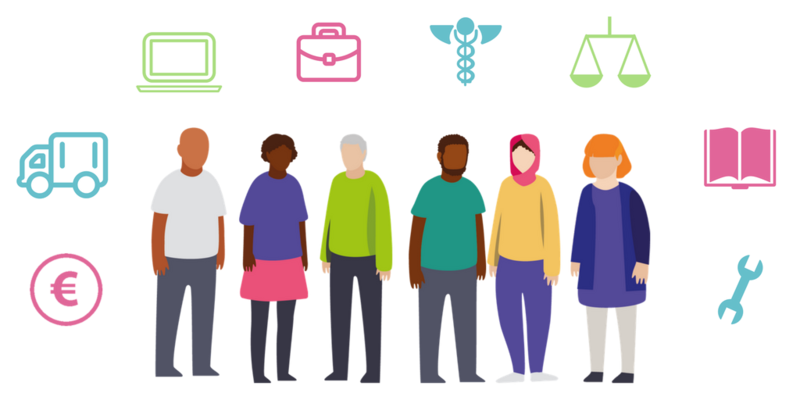 The Retirement and Fixed-Term Contracts Guidelines are for employers and employees, and seek to ensure that older workers, who wish to continue in employment, are not discriminated against in their workplaces. The Guidelines focuses on the threat of discrimination arising from the offering of fixed-term contracts to persons over the compulsory retirement age. They consider practical issues that arise from granting fixed-term contracts to employees who are over the compulsory retirement age, and explain how these issues may be addressed by both employers and employees. The Guidelines consider the setting of compulsory retirement ages, and the dismissal of employees who reach that age. Both of these actions are subject to the requirement of “objective justification”. The Guidelines explore what “objective justification” means and what the relevant test involves. Both private and public sectors are currently exploring opportunities and confronting challenges presented by an aging workforce. 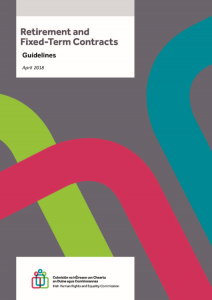 These Guidelines serve a dual purpose: they equip employers in meeting obligations under the Employment Equality Acts; and they inform employees about their right to equal treatment in the workplace. Mark works in an administrative role in the insurance sector. His employment contract states that he is subject to a compulsory retirement age of 65. Upon Mark turning 65, Mark’s employer terminated his contract of employment but offered him a fixed term contract for a period of one year. Mark is happy in his current place of employment, he feels healthy and wants to continue working well beyond the age of 65. Mark objected to the one year term of the contract but subsequently agreed to the offer in the hope that his employer would permit him to keep working into the future. Mark’s employer did not renew his fixed-term contract when he reached the age of 66. Mark is unhappy and feels that he has been less favourably treated on grounds of age. Offering Mark a fixed-term contract and refusing to offer him another will not amount to discrimination on the grounds of age if it is objectively justified by a legitimate aim, and the means of achieving that aim are appropriate and necessary. Sarah is a civil servant. Her employment contract states that she is subject to a compulsory retirement age of 65. Sarah is happy in her current place of employment and wants to continue working, not least because of the fact that she is not entitled to the State Pension until she reaches the age of 66. Sarah makes a request to her employer to continue working under the terms of her original contract. Sarah’s employer refuses to allow her to continue working under the terms of her original contract and informs her that they intend to terminate her employment once she reaches the age of 65. However, Sarah’s employer informs her that they would be willing to offer her a fixed-term contract for a period of one year on less favourable terms. They say this is in order to enable them to find a suitable replacement and to ensure there is a sufficient period for handover. Sarah is unhappy that the fixed term contract is for a period of one year and that she has been offered terms which are less favourable than those under her original contract. First, Sarah’s employer is required to objectively justify the existence of a mandatory retirement age. If Sarah’s employer can do that, the employer will then have to demonstrate that offering her a fixed term contract on less favourable terms as opposed to allowing her to continue working under her previous contract is objectively justified by a legitimate aim and the means of achieving that aim are appropriate and necessary. Maria is 68 and works in the manufacturing sector. Despite working for the same employer for over thirty years, she never received a contract of employment from her employer and was not informed about the terms and conditions of her employment except for pay and working hours. Maria has recently been notified that her employer has introduced a new compulsory retirement policy and that she is going to be required to retire this year. However, Maria’s employer has told her that they are willing to offer her a one-year fixed-term contract to give her time to prepare for retirement. Maria is dissatisfied as she feels that she is not subject to any retirement policy and has not consented to such. In the absence of a specific type of term in a contract (a contractual variation clause), a new compulsory retirement age can only be introduced with the informed consent of the employee or employees concerned. In the absence of such informed consent, the employer has not ‘fixed’ a compulsory retirement age and cannot avail of the exemption provided in respect of the offering of fixed term contracts. Jamie is a single man with no children and has been working with a State agency for the past decade. His contract of employment provides for a retirement age of 65. Jamie wants to continue working for a number of reasons, one of which is that he is not entitled to claim the State pension until he turns 66. He has applied to his employer for a one-year extension. Jamie’s employer informs him that he will be compulsorily retired once he reaches the age of 65 and that his request for a one-year extension has been refused, primarily on the basis that he does not have any dependents. Jamie feels that whether or not he has dependents should not be a relevant factor in determining his request for a one-year extension. He feels that he has been less favourably treated on both the age and family status grounds. It shall not constitute discrimination on the ground of age for Jamie’s employer to set a mandatory retirement age once it is capable of being objectively justified. In addition, the exemption relating to the offering of a fixed-term contract relates only to age discrimination. The circumstances surrounding the offer of, or failure to offer, a fixed term contract may involve discrimination on the other grounds protected under equality legislation. Dimitri works in the retail sector. His contractual age of retirement is 65. Dimitri does not want to retire and has requested to continue working past the mandatory retirement age. Dimitri expects that his request will be granted. A number of his colleagues, some of which are currently in their 70s, were not compulsorily retired when they turned 65 and continued working under the terms of their contracts. Dimitri’s employer has denied his request and informed him that his contract of employment will be terminated upon reaching retirement age. Dimitri feels that this is unfair, not least because of the fact that a number of his colleagues have been permitted to work well past 65. Regardless of a term in a contract which specifies a mandatory retirement age, where an employer applies it inconsistently, it may be difficult for them to establish that employees were in fact subject to a known retirement age or that such a retirement age is objectively justifiable.